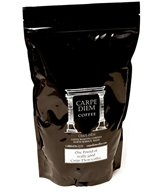 Carpe Diem has opted to combine our Fair Trade Coffees with those that are Organic. We are MOFGA (Maine Organic Farmers and Gardeners Association) and Fair Trade certified. We hope that in time there will be more demand from our customers to be able to carry a greater variety of these coffees. We are pleased to be able to participate in these programs. We believe it is important and possible to offer fair wages and protect our environment. We have a limted selection but they are freshly roasted and blended. A clean and vibrant coffee. A smart coffee with a bright, snappy flavor.